In a swimming pool, there are lanes designated for swimmers. Swimmers get their own lanes to swim in without swimming across another. The concept of swimming lanes also exists in BPMN. Swimlane objects (aka: Swimlanes) in BPMN are rectangular boxes that represent participants of a business process. 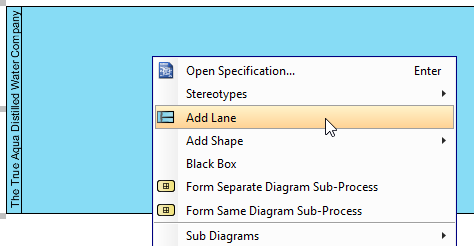 A swimlane may contains flow objects that are performed by that lane (participant), except for black box that must have an empty body (we will talk about black box later on in this tutorial). 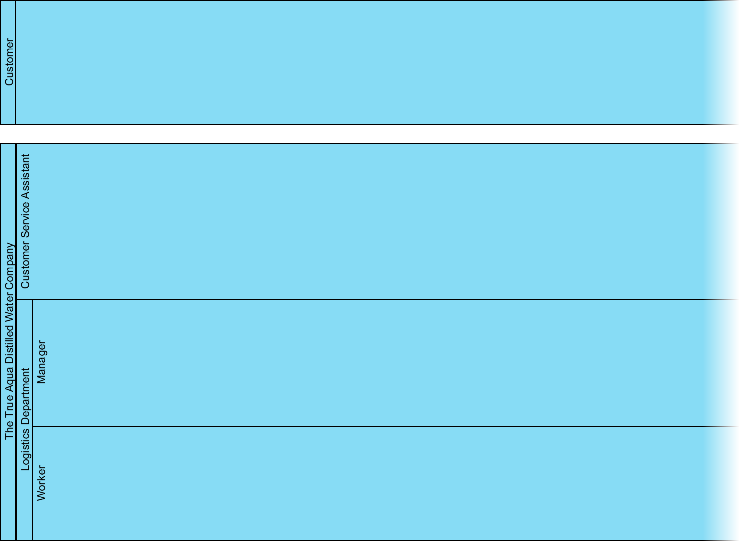 Swimlanes may be arranged horizontally or vertically. They are semantically the same but just different in representation. 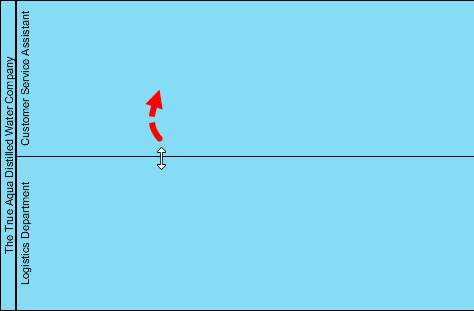 For horizontal swimlanes, process flows from left to right, while process in vertical swimlanes flow from top to bottom. Examples of swimlanes include Customer, Account Department, Payment Gateway and Development Team. There are two kinds of swimlanes: Pools and Lanes. Pools represent participants in a business process. It can be a specific entity (e.g. department) or a role (e.g. assistant manager, doctor, student, vendor). Inside a pool, there are flow elements. They represent the works that the pool needs to perform under the process being modeled. However, there is one kind of pool that has no content at all. It is known as the blackbox pool. Blackbox pool is often used when modeling entities external to the business process. As it is external, its internal flow does not have any impact on the process being modeled, hence can be skipped, producing a blackbox. The following BPD (business process diagram) gives you an example of a blackbox pool. Customer is a blackbox. Since the process focuses on how the chef prepares a meal, what the customer does is none of the process' interest. The use of blackbox depends on the perspective the process takes. If you need to model the process of how a customer places an order, the flow of Customer will be modeled, making the Chef pool a blackbox. Lanes are sub-partition of pools. For instance, when you have a pool Department, you may have Department Head and General Clerk as lanes. Same as pools, you can use lanes to represent specific entities or roles who are involved in the process. Lanes may contain other lanes to form a nested structure when needed. 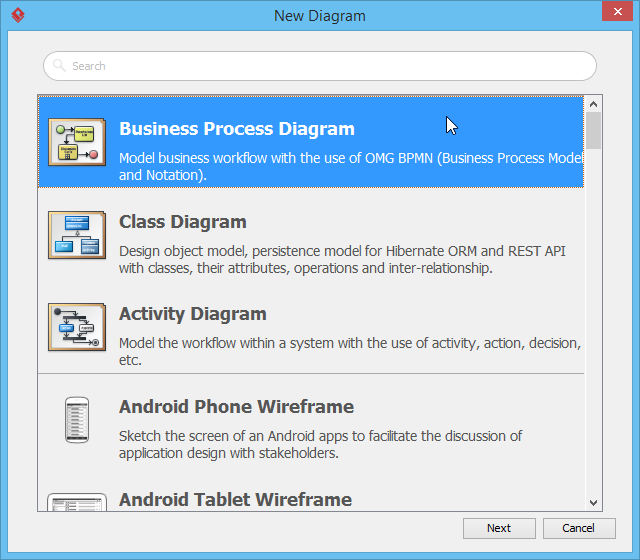 However, BPMN helps you primarily on modeling business process. Do not try to build nested lanes just for modeling the structure of your organization. If you want to model the organization structure, use the organization chart instead. The True Aqua Distilled Water Company is a young distilled water supplier in the city. They sell distilled water for business and for home use. Now, the True Aqua Distilled Water Company wants to increase their market share from 5% to 10% in the next 12-18 months. To reach this objective, they are trying to find ways to increase operating efficiency and to fulfill higher level of customers' satisfaction. As a result, the True Aqua Distilled Water Company has decided to improve their distilled water ordering process. Now, you are a business analyst who are responsible for this mission. After meeting with the True Aqua Distilled Water Company, you have collected the following information about the ordering process. Let's take a look. The customers can either call the ordering hotline or send us Email to order distilled water. Currently, 90% of the orders come from phone calls, while 10% orders are placed by Email. The customer service assistant who receives the order will check whether the customer is an existing customer or a new one. If the customer has never placed order before, the customer service assistant will create a customer account for him or her prior to processing the order. The delivery of distilled water is carried out once a week on every Wednesday. So, on every Wednesday morning, the customer service assistant will forward orders to the Logistics Department for delivery. Once the manager in the Logistics Department has received the orders, he will arrange the delivery by assigning workers to manage different orders, printing and posting the schedule. The workers receive the calls and deliver water to the customer accordingly. Now, you need to model the process in BPD with BPMN. In this section, you will be guided through the steps to create the necessary swimlanes in BPD. The modeling of process flow will be described in the next part of this tutorial. Create a new project by selecting Project > New from the application toolbar. In the New Project window, click Create Blank Project. Create a new business process diagram by selecting Diagram > New from the application toolbar. Enter Distilled Water Order Process as the diagram name and click OK to create the diagram. You will see the following window. 1 Application toolbar The application toolbar provides you with accesses to various operations in Visual Paradigm. 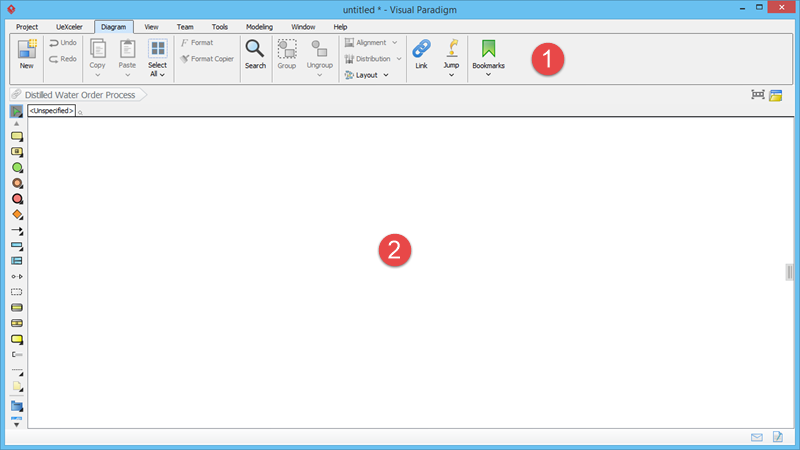 2 Diagram Editor The area where you edit your diagram. By reading the details of the ordering process collected from users, you understand the collaboration between customers and The True Aqua Distilled Water Company and are able to identify the following entities that need to be modeled in the BPD, as they are involved in the process: Customer, Customer Service Assistant, Logistics Department, Manager (in the Logistics Department) and Worker (in the Logistics Department). You should model them with BPMN pools and lanes. Let's create the Customer pool first. 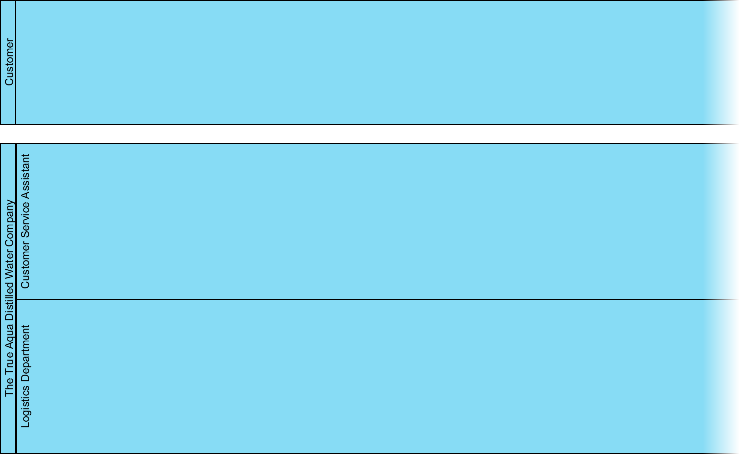 Select Horizontal Pool in the Diagram Toolbar. Click on the BPD (in the Diagram Editor) to create a pool. Enter Customer as the pool name and press Enter to confirm. Note that a pool extends the entire length of the diagram horizontally. You may create separate pools for Customer Service Assistant and Logistics Department. But to highlight the fact that they are under the same company, it would be better to create a pool for The True Aqua Distilled Water Company and make Customer Service Assistant and Logistics Department lanes of the pool. Create a pool below Customer. Name the pool The True Aqua Distilled Water Company. Let's create lanes. Right click on the pool The True Aqua Distilled Water Company and select Add Lane from the popup menu. Enter Customer Service Assistant as name. Press Enter for confirmation. Create the lane Logistics Department below the Customer Service Assistant lane. Right click on Customer Service Assistant and select Insert Lane After from the popup menu. Enter Logistics Department as name. Press Enter for confirmation. The lanes are too wide. Let's resize them. Press on the lane border and drag upwards to resize the lane Customer Service Assistant. To resize the second lane, press on the bottom pool border and drag upwards. Inside the Logistics Department, there are two entities who take part in the process. They are the manager and worker. For this reason, you should create them inside the lane Logistics Department as nested lanes. 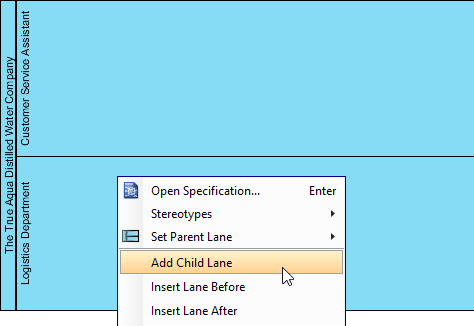 Right click on the lane Logistic Department and select Add Child Lane from the popup menu. Enter Manager as name. Press Enter for confirmation. Right click on the lane Manager and select Insert Lane After from the popup menu.